Discussion in 'Tony Ortega' started by RSS Feed, Feb 8, 2019. "A fake letter from a fake organization that's a front group for a fake religion." I hope this goes to Court. I had posted on another thread last year, here on ESMB about I believe, the St. Louis Scientology Org using Trade Marks of the National Football League in their LRH Birthday Game posters.... I did call the NFL about this....but was pretty much blown off. I guess I should have put it in a letter in written form. 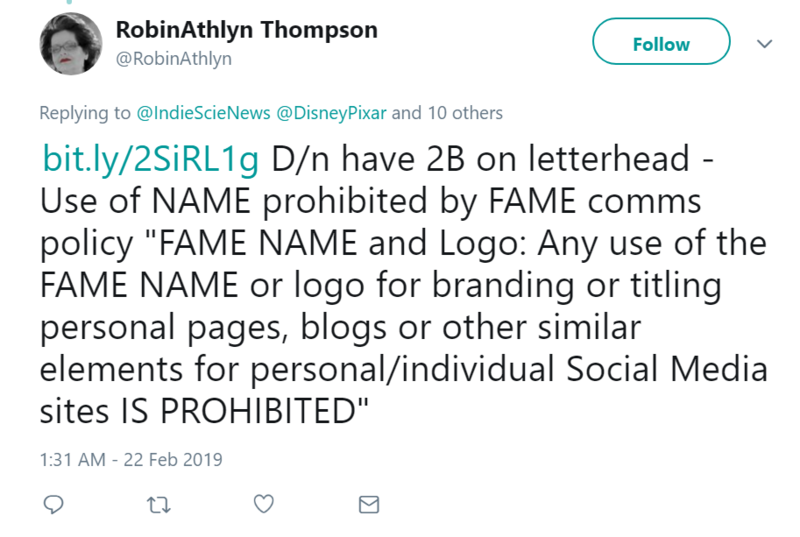 Some poor Sea Org member had to be put under some pretty intense pressure to be desperate enough to falsify this letter to Disney. I think it is telling that it was on "discontinued letterhead". So whoever did this has been going around collecting blank letterhead from people and organizations that participate in interfaith activities for so long that the letterhead they have is no longer used? In December 1972, the church launched a new attack called Operation Dynamite. That month, a woman ostensibly soliciting funds for United Farm Workers stole a quantity of stationery from Cooper's apartment. A few days later, the New York Church of Scientology "received" two anonymous bomb threats. The following May, Cooper was indicted for making the bomb threats and arraigned for a federal grand jury. The threats had been written on her stationery, which was marked with her fingerprints. The charges were eventually dropped in 1975 with the filing of a Nolle prosequi order by the local US Attorney's office, but it was not until the fall of 1977 that the FBI discovered that the bomb threats had been staged by the Guardian's Office. A contemporary memorandum sent between two Guardian's Office staff noted on a list of jobs successfully accomplished: "Conspired to entrap Mrs. Lovely into being arrested for a felony which she did not commit. She was arraigned for the crime." Yes, and according to Dr. Hubbard's technology--a being only commits OVERTS as a solution to a PROBLEM. THE PROBLEM: A downstat graph on a wall somewhere inside a remote cult compound that represents the imaginary destruction of the cult's imaginary enemies using an imaginary technology resulting in imaginary wins and imaginary planetary clearing. Worse, it's forgery and Identity theft. Scientology just couldn't take being out of the news. We just broke February. hmm, how about: Scn Heaped In Trouble? The University of Southern California has been forced to open an investigation after discovering that the Church of Scientology may have forged a letter from one of its professors, begging Disney Corporation CEO Bob Iger to censor Leah Remini's Scientology expose series, "Leah Remini: Scientology and the Aftermath." USC Fellow Dr. Cecil “Chip” Murray -- a longtime friend of the Church of Scientology -- appears to be a key member of this "interfaith coalition," and, according to a Scientology press release issued recently, authored a very terse and demanding letter to Iger, on USC letterhead, about Remini's program, alleging that Disney is "complicit" in "violence" that has come about as a result of Remini's investigations, and accusing Disney of "inciting hatred" against religion. Wouldn't this be using the US Mail to commit a crime? A report from Robin Athlyn Thompson. The Murray letter currently on the STAND website is below. To read the letter you may have to enlarge it. I'll note the letter is not technically on the letterhead of the First AME Church of Los Angeles (FAME). The letterhead does note Rev. Dr. Murray's status as "Pastor Emeritus First AME Church of Los Angeles." 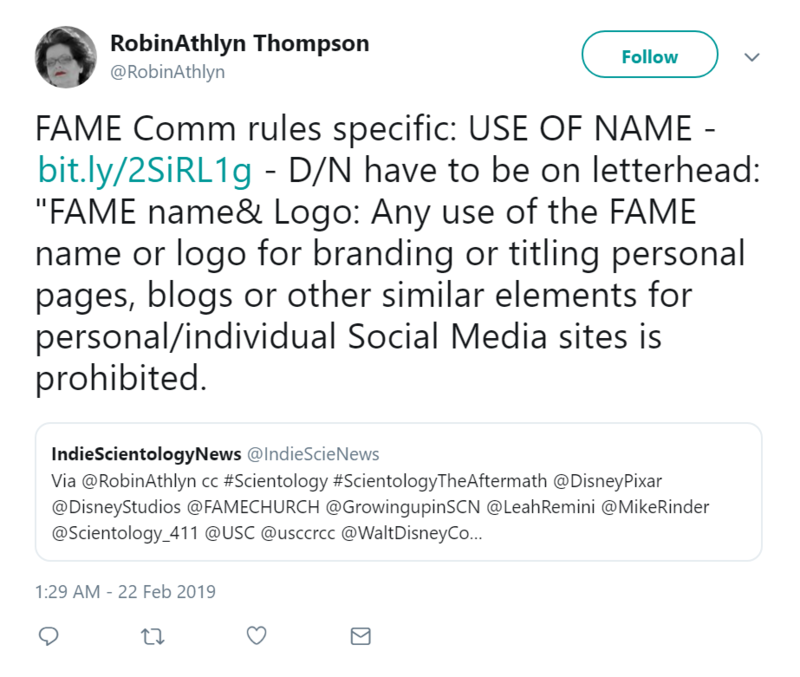 But within Scientology, fraudulent activities such as this are a religious sacrament. More tweets by Robin Athlyn Thompson. I believe these were in response to my observation about the letterhead. I’m curious if she’ll share her conversation with the pastor she mentioned or if her tenacity has prompted him to finally make a statement, so she’s giving him time to do so. Either way, thank you Com I/C for keeping this out there and thankful for Robin continuing to pursue. This will be interesting to follow for sure! There is a Fake Hate Crimes Website. I came across this website recently and don't know anything about it....or who is running it. But it seems to me that after reading that letter above....it would qualify to be added to the website. 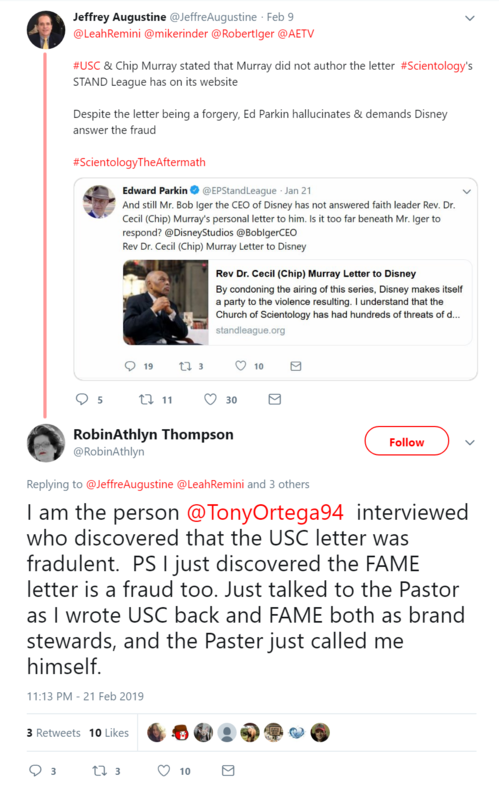 Is there a data base of Fake Scientology hate crimes? All the "Fair Game" they do....there should be.